I’ve always liked traveling around which I’ve done for many years in the past; having moved to a different country in my childhood probably stimulated this later. Now living in one place for a long time makes me miss the traveling world now and then. Not that I’m sitting at home doing nothing, I do get out on the water every week, and paddle and bicycle through the fields and along the shore. I started to get involved in other peoples expeditions by sending sms messages to our club expeditions. Mainly in Greece, and later in different parts of the world. After some years, others heard about me and started asking me to help them on their expeditions. The great thing is that although I’m not traveling myself, which is not so great, but helping others in their expeditions and being involved deeply in their travels makes me feel like I’m part of their expeditions. Which also makes me feel I have to do my best. Another nice thing is getting in touch with people from different countries; some I have met, some not, and you start a friendly relationship being in touch daily through email or satellite phone messages. 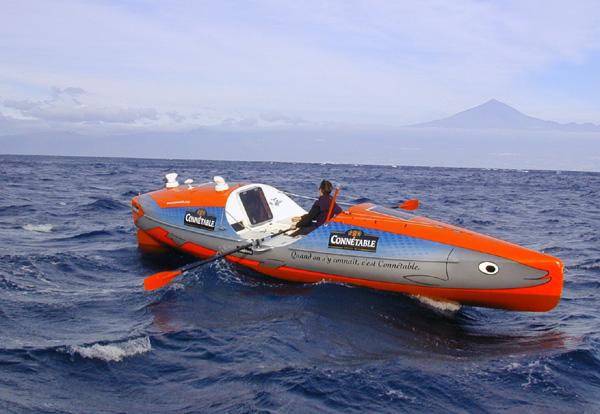 I also like to read about different expeditions like ocean rowing . This used to be a dream of mine in the beginning, and after reading Kontiki I had serious thoughts about doing something like it, especially having grown up on an island in the Netherlands (Terschelling). As a child we made rafts out of oil drums and went on the Wadden Sea which lies between the mainland and the islands of the Dutch coast. Having known some people in the past that have made Atlantic crossings on rafts, I got pretty close to joining once but that’s as close as I got to it, oh well life goes on. I think you never know what will happen in the future, so who knows maybe I’ll get involved in an expedition myself. It reminds me of what people used to say to me in the past when I was in my traveling days and not staying in the same place more than a few months, people used to tell me I’m lucky that I can go when I please, and I remember telling them you can also do what you please, you just have to make that decision. Once you put an anchor in some place you can always haul it up and move on.